This book has been written mainly to help the newcomer in fluid-inclusion work learn how to use fluid inclusions and to avoid many of the pitfalls and blind alleys that beset anyone starting in a new field of research. Of course, it is impossible to avoid all such diversions. However, too often, writers of scientific papers (and some editors) seem to believe that it is undesirable or even demeaning to report experimental details and the various problems that had to be overcome in the work. I do not agree with this approach. Why should subsequent workers be frustrated and waste much time solving problems that others have already solved? Give them the benefit of previous experience so that they can get on with new work; in so doing, they will encounter enough new problems of their own. One difficulty in presenting a subject such as fluid inclusions is the surprising degree to which the chapters are interrelated. I have tried to strike an appropriate compromise between repeated referral to other chapters and excessive repetition, because everything cannot be put into logical sequence without redundancy. Chapters 11-18 attempt to discuss the many applications of fluid inclusions to the study of and understanding of geologic processes and the geologic environments in which they acted. For the reader's convenience, I have categorized all environments from which fluid inclusions have been studied into these eight chapters. The arbitrary dividing lines between such environments are never sharp, nor generally acceptable, particularly if more than one geologist is asked, so I hope the reader will forgive me if my semantics disagree with his or hers; the differences are of no real consequence to the points being made. Although some of the data and ideas in this book are new, other parts come from earlier papers of my own or from those on which I have been a coauthor. I make no apology for this, as I see no point in using quotation marks or trying to rephrase one's own words. Only about a third of the text is taken more-or-less directly from these earlier works (with modifications). Similarly, many but not all the photomicrographs have been used earlier. In the choice of examples, I have leaned heavily on those from my own experience and papers, mainly because this procedure is less prone to errors from misquotation, and because I have all the negatives of the photomicrographs I made in these studies. In a petrography class, in 1939, my teacher, Dr. Donald M. Fraser, showed me some inclusions in Precambrian quartzite in which the bubbles were rapidly bouncing around in their tiny cells, as they presumably had been for more than a billion years. This so intrigued me that after completing graduate work (more than 30 years ago) I started studying fluid inclusions. I hope that some aspect of this book may, in the same way, intrigue others. I have tried to help the reader by including chapter outlines and a detailed index, and in the References I have listed the page(s) where each item is cited, as this also can help the reader to become acquainted with the rather large and scattered literature and some of its applications. The overall organization is somewhat of an adaptation of the news reporter's outline -- "who. what, when, where, and why": what kinds of information inclusions provide. when and where inclusions form. how they change, how to prepare material and make microthermometric measurementsl, how to interpret these data, and then what has been found in applications of fluid-inclusion studies to each of a series of different geologic environments. As in most developing areas of science, numerous erroneous concepts, procedures, and statements have been published (including some of my own). I have a file of several hundred of these errors, but most do not merit attention and hence are not mentioned in this volume, except where they may have led to more than occasional confusion or misunderstanding by later workers. Caveat emptor. 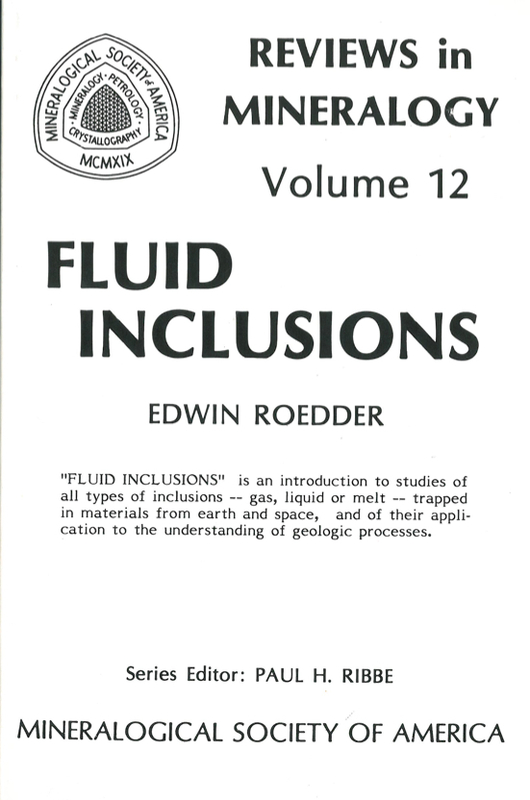 FLUID INCLUSIONS is the first single-author contribution to be published by the Mineralogical Society of America in its decade-old series, begun as SHORT COURSE NOTES but since 1980 issued under the title REVIEWS in MINERALOGY. Edwin Roedder, who assembled the encyclopedic work after more than thirty years' study of fluid inclusions in minerals, is eminently qualified for the undertaking. He has been the editor and primary contributor to FLUID INCLUSION RESEARCH -PROCEEDINGS of C0FFI, since its inception in 1968; these volumes provide citations and abstracts in English of the 800-900 items published each year on fluid inclusions. In 1965 Roedder edited an English translation of a massive work by N.P. Yermakov and others (see Ermakov, 1950), and in 1972 he published COMPOSITION of FLUID INCLUSIONS, U.S. Geological Survey Professional Paper 440JJ. As retiring President of the Mineralogical Society of America, he delivered his presidential address, The Fluids In Salt, exactly six months ago at MSA's annual meeting in Indianapolis. 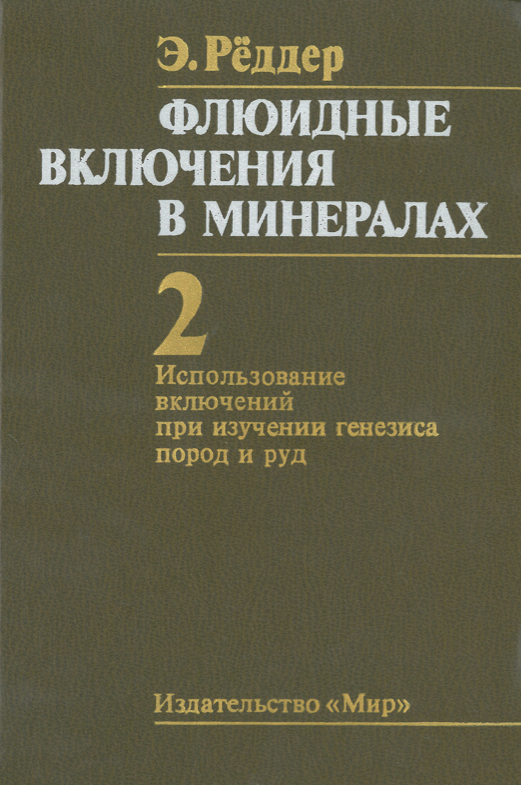 The organization of this book is somewhat different from previous volumes in that the Table of Contents lists only chapter titles: detailed contents are given on the first page of each chapter. Other unique features (made possible by the fact that there was no time pressure from an impending Short Course) are the Subject Index and the Locality Index at the end of Chapter 19, followed by an extensively cross-referenced bibliography. Note for the Second Printing: ERRATA A substantial number of corrections have been made to the second printing of FLUID INCLUSIONS. 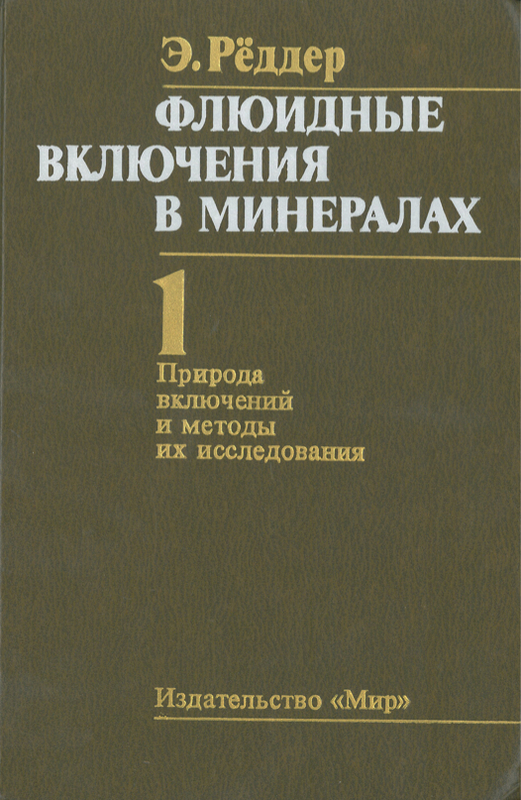 For those who own a copy of the first printing, a list of the errata is given on pages 645 and 646 of this volume to facilitate locating the changes.